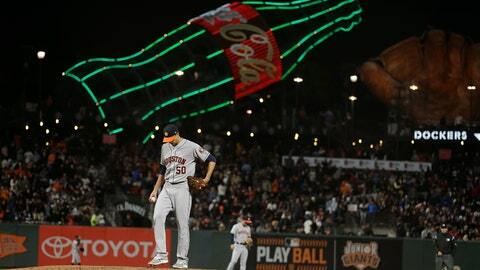 SAN FRANCISCO (AP) — Roberto Osuna needed five pitches for a clean inning and a nice on-field impression on his new teammates. Osuna earned the win in his first appearance with Houston after Marwin Gonzalez hit a three-run homer with two outs in the ninth inning, lifting the Astros over the San Francisco Giants 3-1 on Monday night. Osuna (1-0) hadn’t pitch in the majors since May 6 while serving a 75-game suspension for violating MLB’s domestic violence policy. The former Blue Jays closer was arrested and charged with assaulting his girlfriend May 8 in Toronto. Few details have been made public, and the next court date in the case is scheduled for Sept. 5. Osuna was acquired from Toronto last Monday in a deal that sent back closer Ken Giles, and he became eligible to pitch Sunday . A few fans booed when he entered the game in the eighth inning, and Osuna calmly retired the side in order. Hector Rondon closed out the 2-hour, 26-minute game with his 12th save in 15 chances. San Francisco closer Will Smith (1-2) blew his second save in nine opportunities after issuing walks to Alex Bregman and Yuli Gurriel. Gonzalez followed with a towering drive to left for his 10th homer. Brandon Crawford hit a solo homer in the sixth inning, but San Francisco failed to do enough to back rookie Dereck Rodriguez’s latest gem. The two starters had a nice duel but nothing to show for it. Rodriguez struck out seven with no walks and allowed three hits in seven innings. Charlie Morton, a 12-game winner, struck out eight over seven innings with three walks and three hits. The Giants lost for just the third time on days Rodriguez starts — and this marked just his 11th in the big leagues. The son of Hall of Famer Ivan Rodriguez has quickly emerged as one of the top rookies in the National League. Rodriguez has allowed three or fewer runs in 10 of his starts. Astros third base coach Gary Pettis attended 49ers practice to see son, Dante, a second-round rookie wide receiver out of Washington. A concession stand caught fire approximately three hours before first pitch near section 121 on the main concourse of AT&T Park. The blaze was out by the time the fire department arrived, there were no expected delays and no fans had been let inside yet, according to Jorge Costa, Giants senior vice president of ballpark operations. “This happens occasionally,” he said. Astros: World Series MVP and All-Star outfielder George Springer went on the 10-day disabled list with a left thumb sprain he hurt during Sunday’s loss to the Dodgers on a headfirst slide. … SS Carlos Correa, recovering from lower back soreness, was off from his rehab assignment and scheduled to play nine innings both Tuesday and Wednesday for Double-A Corpus Christi before being activated when the Astros start their homestand. … RHP Lance McCullers Jr. (right elbow discomfort) won’t pitch until September, if at all. There’s no timetable for when he could begin throwing, Hinch said. … RHP Chris Devenski (left hamstring tightness) was examined by a doctor and will throw a bullpen later this week once the team returns home. … C Brian McCann (right knee soreness) caught Justin Verlander’s bullpen Monday. Astros: LHP Dallas Keuchel (9-9, 3.61 ERA) lost his only previous start vs. San Francisco. Giants: LHP Madison Bumgarner (4-4, 2.97) needs one victory for fourth place on the San Francisco wins list. He has won his last four starts against the Astros with a 1.20 ERA but hasn’t faced Houston since a five-hitter with 12 strikeouts on Aug. 11, 2015.